The beta testing of XonarSwitch is taking place on the MaxedTech website, allowing the author of the application to gather user feedback from the UNi Xonar community and give its members the opportunity to try out the application and contribute to its growth and polishing. Windows XP and later, both x86 and x64. 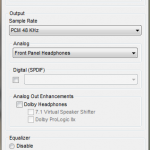 Ability to change the Sound Card settings on the fly by directly interfacing with the driver. 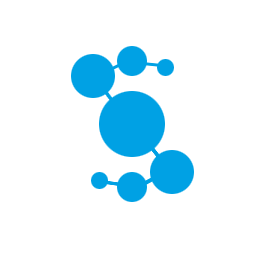 No DPC latency increase: although it sends commands directly to the Xonar driver, it does so only when a profile is activated and only for the settings that actually change. It doesn’t continuously poll the driver. Ability to configure itself depending on the hardware it runs on, showing only the relevant options. Fully customizable global keyboard shortcuts usable to switch profile even when in a full-screen applications like a game. Supports Headphones Gain where applicable. Easily clone a profile by editing the source profile and then changing its name. Live mode allows to hear the effects of your settings in real time. Can replace the system volume icon, with a volume popup that is displayed by left-clicking once on the XonarSwitch tray icon. Some Xonar-specific options like analog output selector, SVN and hardware peak meter are present. Very compact and portable: only one small EXE, no dependencies, no need for external DLLs, no need for a setup: drop it and launch it. If run elevated, it enables autostart by default on first run, which can be manually disabled by the user. Built-in self-update code: it periodically checks for new versions and updates itself automatically. Master volume: leave unchanged, apply last used for the same combination of output panel and speaker type, or set a specific volume and balance. SVN (Smart Volume Normalization): leave unchanged, enable or disable. System Speakers: leave unchanged or set a new layout. Set an analog output option: same as Asus Control Panel, including switching between front and rear panel where applicable. Exchange headphones left / right channels: leave unchanged, enable or disable. Exchange center / bass channels: leave unchanged, enable or disable. Exchange side / rear surround channels: leave unchanged, enable or disable. Headphones Gain: set gain mode where applicable. On the Xense, Sennheiser mode is supported. SPDIF Output: deactivate or activate, choice between PCM and relevant options (Dolby Digital and/or DTS Interactive depending on the card model). Analog or Digital out enhancements: support for Dolby Headphones, Dolby Virtual Speaker, 7.1 Virtual Speaker Shifter, Dolby ProLogic IIx, DTS NEO:PC depending on the card model. Each output channel volume (depending on the card capabilities and the analog output layout selected): don’t change or set a specific value. Equalizer: don’t change, deactivate and activate, setting a 10 band profile with presets and user-defined gain profiles. The sliders give precise feedback from -20dB to +20dB allowing for 1dB-accurate calibration. FlexBass: deactivate and activate, setting the LTE crossover frequency as well as the speakers’ size. AEC: enable or disable where applicable. AEC requires a particular voice DSP that some models don’t have and thus it’s not always present. Some values might correspond to input lines that aren’t present on a specific card model and therefore are ineffective if used. XonarSwitch doesn’t load any user interface and runs even if there is another instance already active in the system tray. It executes other command line arguments and then exits. Autoupdate isn’t triggered even if a new version is released. Cycles among all available profiles in the same order they appear in the profiles window. Cycles among all provided profiles in the same order they appear in the profiles window. Profile names should be separated by a single comma. 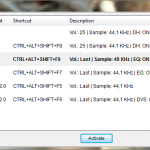 Toggles master volume mute state. Toggles <INPUT_LINE> volume mute state. Adding support for the DG / DGX jack autosensing feature. Suggestions by the community where feasible and when cost/benefit positive, after the application is stable on various hardware and software platforms. XonarSwitch is designed to take advantage of the ClearType functionality, added by Microsoft to the Windows operating systems since Windows XP. ClearType is basically a text antialiasing feature that improves readability and reduces eye strain when using flat panel displays. Starting with Windows Vista, ClearType is enabled by default, while on Windows XP it had to be manually activated by the user. To enable ClearType under Windows XP and enjoy a clearer and smoother XonarSwitch interface, read this article by Microsoft Support. The words “ASUS”, “ASUSTek”, “Xonar”, the Xonar logo and the original Xonar icon are trademarks of ASUSTeK Computer Inc. Virus is the author of the Standalone Apps scripts source that got me started with this project. One of the 7.1 Virtual Speaker Shifter layouts used by XonarSwitch is by Luis U and guarantees an optimal perception of 3D positioning in games. The Xonar Icon with a transparent background is by bullseye. Although the code has been written with care, it’s still a beta application, and like all software in general and beta software in particular is by definition prone to defects. The author can’t exclude that some malfunctioning in the application could cause sensible settings like the system master volume or headphones gain to be misapplied and thus cause damage to your hearing or the audio equipment. The software is provided as-is and free of charge, and by downloading the application and executing it, you explicitly declare the author is not responsible for whatever damage may be caused by the use of XonarSwitch. Currently supported features might be dropped if the beta testing phase feedback reveals technical problems unforeseen by the author during the development process. XonarSwitch is guaranteed free of malicious code. It has been tested and whitelisted by WebRoot. Beta feedback is essential to get XonarSwitch to run smoothly on all software and hardware platforms. Always include your system info. Right click on the XonarSwitch tray icon, click on “About XonarSwitch…” and then on “Copy System Info” and then paste the data in your message. Provide step-by-step instructions to reproduce the error / wrong behavior. Be ready to test a private release that attempts to address the problem you reported. Please note that during beta, feature requests will have very low priority, since the development focus will be on getting rid of bugs. If the general feedback by the community is positive and the application reaches a state of reasonable reliability, they will be taken into consideration later on. Right-click on XonarSwitch’s tray icon and then on the “About XonarSwitch…” menu. In the about window, clicking on the developer’s name will copy his mail address in your system clipboard, and you can then paste it in the recipient field of your mail or webmail client. For a list of previous release notes, please see XonarSwitch Version History. I am of Polish, contents of the message in Polish. I really would ask for a repair. Can you please send me an e-mail (the instructions are in the post above)? I might have to ask you for additional information, and I’ll also need you to test tentative fixes, since I can’t reproduce the problem on my machines. Hi, have you found the cause for this problem? I have a similar issue on both of my PC’s when shutting down. Both are using Essence STX on latest drivers and latest XonarSwitch, Windows 10. It will be amazing, if we could restore upxming withouth switch source setting 2ch/6ch. I’m trying the new 1.80a driver on my X-Meridian 7.1 and is very great! This is not a XonarSwitch problem. This is a driver problem. I don’t know of a way to do that except what I’ve already written in FAQ Q&A4. I know… it’s an old driver problem, when all sound devices abandoned the Windows XP hardware mixer, since Windows Vista and the new software mixer. Some cards still do it in some way (I don’t how). I’m trying to use XonarSwitch but the digital compression (DTS/DDL) doesn’t still active when I don’t play anything and it makes lag and noise when I start to play something. But if you know, why did you post the question under the XonarSwitch page? About your XonarSwitch problem with DTS/DDL you should make a new comment instead. I’m trying to abandon C-media panel for Xonar Switch, but the digital compression (DTS/DDL) doesn’t still active when I don’t play anything and it makes lag and noise when I start to play something. p.s. For the previous question I’m sorry for OT, my bad. Enable Monitoring on record – Line-In with the record volume to 0. Hey, great piece of software, now I can simply switch between headphones and speakers. I can make a shortcut, which toggles between speakers and headphones. Can you make a function, that I press a key, and it switches profiles? Thanks a lot, works perfect! I was really surprised when I even found the option to disable/activate the upmix option.. You’re a genious! OMG I love you! This is working flawlessly so far for me on a Windows 7 64-bit machine with an ASUS Xonar DX 7.1 PCI Express card. I can finally swap from headphones to speakers with a simple click and retain all my 7.1 sounds. A great convenience. Thank you. Hi should the Headphones volume be separate to the speakers volume? When I use my speakers the volume is 20% but when I use my headphones 20% is too loud. You can switch on the fly without problems. Is this using XonarSwitch? When I switch using set 20% volume from RP 2.0 and then RP HP the volume remains at 20%. Yes. 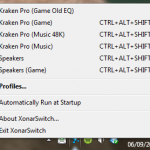 You need to edit profiles (right click on xonar switch systray icon > profiles > select profile > edit), and click on “Set to” and set your % on bar (very left – lower part), click “Save” to save your changes on profile. The same with the other profile at higher % of volume/speakers. The latest version has a recording balance problem. I do not know which version the problem originated from, but I want to test anything. The ones that I have saved are v0.9.0.557 and v0.9.0.636. Let us know if any of the older XonarSwitch versions don’t have the problem. Very very grateful. v0.9.0.557 works well. v0.9.636 does not. Because of your compassion, I was liberated from my long discomfort. Thank you again. Glad to hear it worked. You are welcome. There is a trigger to the recording balance bug, I can’t remember what it was. Do you know what action triggers it? mh0001 and me have already mentioned here at sep 2015. Trigger is the start of the xonarswitch. Thanks again~! It isn’t only happening on start, it also happens when I launch Audacity and select my mic in WASAPI. I see it because it then changes the profile icon. @CarvedInside: Btw, does approving of new comments mean that Giulio is back? No, it does not. I just approved the comment because it was something I and others could help with. ATM I don’t have any new info on Giulio’s intentions. Hi, any way to avoid the left/right channel being swapped when changing profiles to use headphones? It do not occur every time, only sometimes, but is a little annoying, because you need to open the program and go to the Analog option and enable/disable the swapping to fix it. I already have this option to Disabled in my profiles but seems like it is not being applied correctly. XonarSwitch development, troubleshooting and feedback collecting are on hold for the time being. Until such time when Giulio will be able to resume work on XonarSwitch no new comments will be approved. All the effects and EQ don’t work anymore when output is switched to SPDIF. Yeah thats intended as its digital output and needs bit perfect stream so no altering is applied weather its EQ or other effects. Wanted at least Dolby Virtual Speaker to work. Maybe I’ll go back to analog for it. I love XonarSwitch and have been using it for years. But now I want to backup the profiles I created, can you tell me the path were I would find them? I looked at Program Files and Appdata and didn’t see anything perticular? 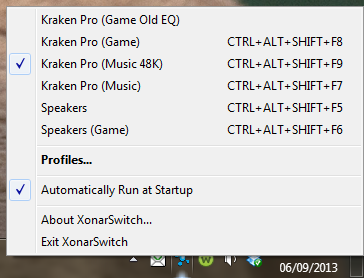 right click at the xonarswitch tray icon and select options, from there you get to back up the registry entries which contain your settings and profiles.